It's been a few years since we've seen a new handheld DAB radio from Pure, the award-winning PocketDAB 1500 jostling position with Roberts' SportsDAB II at the top of the bestseller list. Pure's latest contender, the Move 2500, encompasses DAB and FM in a smart unit. Pure Move 2500 features an aluminium fascia and graphite mirror-finish front panel, with control design evoking (no pun intended! Ed) memories of the iPod. Noise-isolating in-ear 'phones combine with separate bass and treble control adjustment, making the Move 2500 ideal for use out and about. As with the Pure PocketDAB 1500, the Move 2500's headphones act as the aerial, and you can easily swap the supplied 'phones for your own cans if you prefer. Pure's new handheld is supplied with an internal, swappable rechargeable battery (the ChargePAK M1), good for around 14 hours' between charges. The Move 2500 can either be charged up using the supplied AC adaptor or via a powered USB port. Favourite presets are accessed from a dedicated button (there are 10 DAB and 10 FM to hand). One interesting aspect of the Move 2500 is the fact that it is multistandard, featuring DAB, DAB+ and DMB-R (Band III and L-Band), alongside FM with RDS station naming. The radio will work abroad in countries where the DAB+ and DMB standards are used, for example, in Australia. Although the UK sticks to the DAB standard, there is a more efficient DAB+ standard in use abroad in countries such as Malta, Australia and Italy. The Move also supports the DMB standard used in France and Norway. This means you can take your DAB radio on holiday (providing you have the correct mains travel adaptor) if you wish. In any case, you can still receive stations on FM abroad. No plans have been announced to switch to the DAB+ standard in the UK, however, some consumers like to 'futureproof' their purchase. Critical dimensions for the Move DAB are 102mm x 56mm x 15mm and the unit, with battery installed, weighs in at 105 grams. The Pure Move 2500 is available in a black finish online right now. 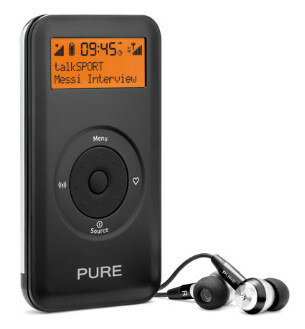 DAB portables and iPod docks, on this site.